Back in the late 70’s Renato’s (a first generation born American) parents, the Venturinos, had grown tired of the city life cooped up in a small apartment. They longed for wide open spaces for their children to breath. When real estate developers came to town and promised land and lots of bright blue sky for the right price, the sound decision was made to become part of the Amrep generation and some of the original settlers of Rio Rancho, New Mexico. Well, where there are Italians, Italian restaurants will always follow. Uncle Frank & Aunt Clara Montanile were the original owner of Venenzia’s, but everyone worked in the business, including Renardo who makes it clear he did everything, including busboying/dishwashing/mopping the floors etc., and did it all for a mere $3.35 hr. He learned the business from the ground up and is very proud of it. Venenzias thrived in Rio Rancho until 1995, when Frank decided to retire and close the beloved restaurant doors. They remained closed until 2000. In 2000-Renardo, Aldo and Uncle Frank Opened her back up and ran it together for another 4 years. Then In 2004 Frank retired for good. The brothers decided to take their own piece of the pie and head in different directions. Aldo stayed in Rio Rancho and Renato took on ABQ. Gino’s at 3908 San Mateo NE, named after Renato’s son, was born and two years later in 2006 he opened his second location at 1331 Juan Tabo NE. It’s still a family affair. His mom Maria still makes her secret family recipe sauce. Tara his wife cooks and son Gino helps out whenever he is needed. Gino’s has a large menu including extreme pizza, like “Da B0ar’ Der”-pulled pork, Canadian Bacon and jalapeno or the “D Bronx”-Beef Brisket, ground beef, onion. 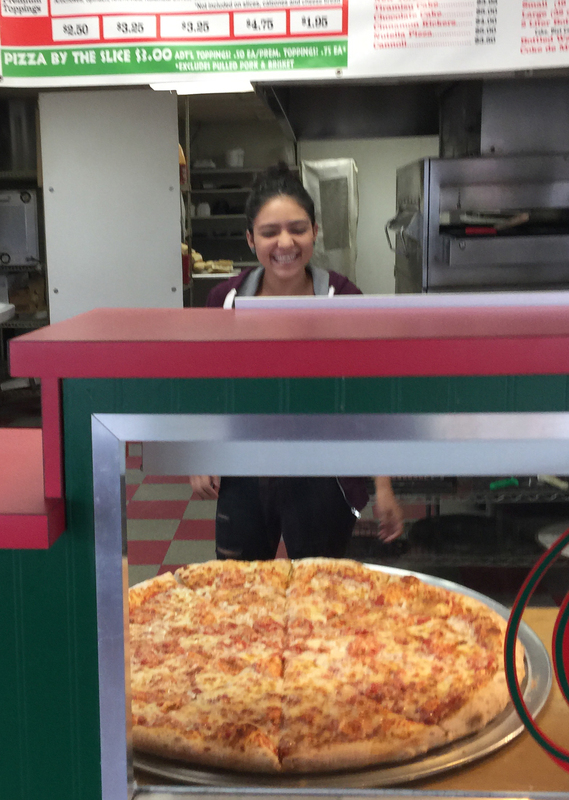 Most of the pizzas come in 12”, 16”, Sicilian and Party size. He offers Gluten free and vegetarian options, a children’s menu and daily specials, like lunch special #4- Large cheese slice-6 wings-small drink for $7.75. Call ahead for drive thru pick up, take it out or eat in. It’s simple delicious food. When you eat at Gino’s you know it will be consistently good. Good old fashioned family recipes and all at a fair price. Mmmmhmmm!